Mr. Frank Peacock, who lives thousands miles away in Shreveport, La., had a heart attack, and his doctor told him he really needed bypass surgery. "They told me I was gonna die," says Frank Peacock, but he was not insured. But Frank Peacock�s health was deteriorating and he read about Apollo Hospital India: "I was in my doctor's office one day having some tests done, and there was a copy of Business Week magazine there. And there was an article in Business Week magazine about Indian hospitals and I came home and went on the Internet and made an appointment, and away I went to India." He made that appointment with the Hospital and he learned that the bypass would cost him about $7,000. He chose his cardiologist and went on the journey. "Every doctor that I saw there has practiced in the United States," says Frank Peacock. He had his bypass done and is leading a healthy life. Ancy Garry from Alaska was on vacation in India when she decided to combine sightseeing with a bit of an eyelift. She was quite nervous "Yes, yes, I was somewhat hesitant about having any type of operation in a foreign country, and it turned out to be, I mean, it was beyond my expectations," says Ancy. It was all in her budget and she paid only $1,500, and that included a private room. She commented on the difference between American and a hospital beyond "It's much nicer than any that I�ve ever stayed in the United States," says Ancy. "It makes sense to establish India as sort of a world destination for health care," says Anjali Kapoor Bissell, director of Apollo�s International Patient Office. Why should foreigners come to India? Well, it�s even cheaper than Thailand or any other country for most procedures, with prices about 10 percent what they would be in the United States. 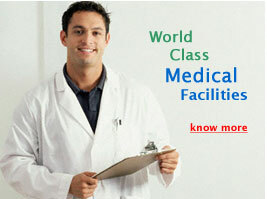 Many of the doctors who migrated to US or UK are coming back and establishing their own hospitals in India. "Yes, a large number are coming back," says Bissell. "Because they have something to come back to."